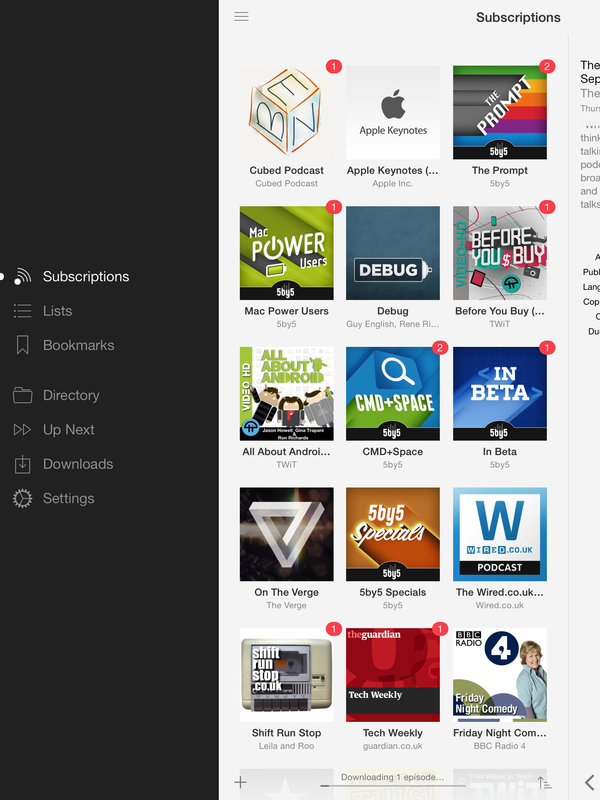 The latest iTunes updates finally forced me to look for alternatives for managing podcasts. In many ways podcast playback across all devices is in pretty rude health. 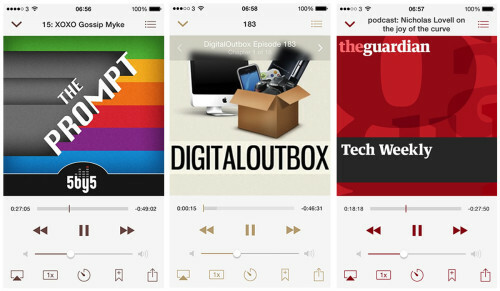 Although Apple’s iTunes and their Podcasts app is still the most popular method for many there are great client choices including Pocket Casts, Downcast and Instacast. The genre is soon to hot up too with Marco Arment announcing Overcast coming soon to iOS. I consume podcasts on my Mac and iOS devices so I was looking for clients that also had a Mac client and sync’d playback between iOS and Mac. That limited my choice down to Instacast and Downcast and after comparing features I settled on Instacast and I couldn’t be happier. Instacast 4 is a brand new version for iOS 7. It’s been updated to fit in better with the new look and feel in iOS 7 and in general Vemedio has done a great job. Controls are clear and easy to use and on the iPad there is a new sidebar that has been added which makes it easy to switch between current subscriptions, smart lists that you have created and the directory where you can search and subscribe to new podcasts. By moving to iOS7 only, the developers have now been able to take advantage of background downloading. This means that subscriptions are refreshed when the device is idle and I’ve found that instead of having to sync my devices with iTunes on the Mac I always have the latest podcasts downloaded in the morning when I get to work – really nice feature. Playback controls are clear and easy to understand and one nice feature are the playback controls will colour according to the podcast album artwork. It’s a nice touch….and I need to get going on an album art update for DigitalOutbox! Instacast supports Airplay and allows you to set playback speed, from 0.5x to 1.5x, 2x and the ridiculous 3x. I do set a couple of podcasts to 1.5x just to skip through them a bit quicker so it’s nice to see this in Instacast. You can set a sleep timer although this is a bit clumsy to use, cycling through the various options one click at a time but once you are used to the options it’s easy enough. You can also add bookmarks to podcasts and easily share the current episode to a variety of social media networks or via e-mail. Show notes and bookmarks are displayed making it easy to jump through links mentioned in a podcast. I’d have liked to have seen more options when clicking on a link in the show notes though – send to Pocket, Instapaper, Pinboard are noticeable misses that I’d like to see added in a future update. One feature I really like is Now Playing. As you navigate around the app the currently playing Podcast is listed at the bottom of the app and just one click away from restarting or cancelling. Very handy. Instacast on the Mac is a simple client giving you access to all the features in the iOS client, and iTunes, but importantly it’s been faster and easier to use than iTunes in my experience. Instacast will check periodically and download new episodes automatically and it allows you to set storage limits if you subscribe to a lot of podcasts but are tight on space. 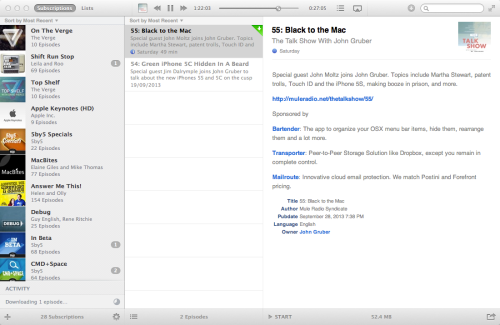 Instacast Cloud is the glue that melds the various clients. This free service will ensure that all your Instacast subscriptions and settings are in sync across your devices. The most obvious benefit of Instacast Cloud is that playback positions are synchronised across Mac and iOS but in addition the following is also sync’d – subscriptions, deleted episodes, played and unplayed states, playback position, favorites, lists and bookmarks. Phew. I’ve found the sync to be fast and reliable although the service did have some downtime this week due to a backup failure. One issue I did stumble on with the cloud synchronisation was with downloads on the iPhone and iPad. Maybe I’m a bit weird, but I like to keep audio podcasts on the iPhone and video podcasts on the iPad. This was easy to achieve with iTunes but as soon as I signed up with Cloud sync on Instacast both audio and video podcasts were downloading to both. 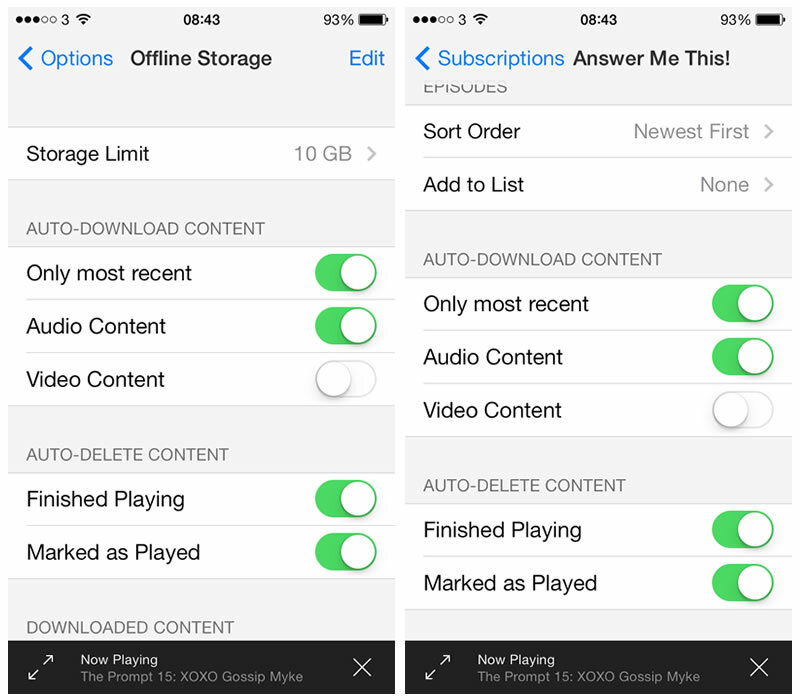 You can set download options on a per subscription basis but these are then kept in sync across iOS devices. Nggghhhhhh. Not a show stopper but I found it annoying. 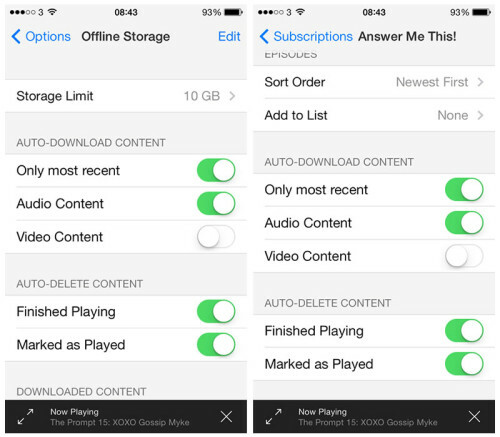 However you can set offline storage options that are per device and not synchronised over the cloud. So setting ‘auto-download content’ to Audio Content on the iPhone and Video Content on the iPad solved the problem. Overall I’m really happy with Instacast and although the applications aren’t free it’s a much better solution than iTunes and one I wish I’d moved to a lot sooner. If you are interested in keeping iOS and Android devices in sync then Pocket Casts is the best option although it too has been updated for iOS 7 and is a little buggy at the moment. Either way, please look beyond iTunes and Podcasts app as there are some great app’s out there that really enhance podcast playback.